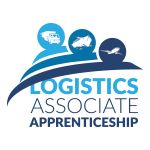 The Logistics Associate Apprenticeship (LAA) allows for entry into the Freight, Logistics, Shipping and Distribution industries, with a broad exposure to the different fields that comprise each section. Through acquiring the knowledge, skills and competence to carry out the core operational tasks/responsibilities, qualified Apprentices will be enabled to make a decision as to the direction they wish their career to progress in. What makes an ideal Applicant for this programme? An interest in International Trade and the Global connectivity of the modern World. A desire for knowledge driven work with problem solving. A career focus with an open mind on progression possibilities.